Properties in Armiñón average 4.9 out of 5 stars. Elai etxea (Apt. Añana) Ideal for groups of up to 9 people. 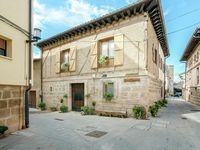 Property 7: Elai etxea (Apt. Añana) Ideal for groups of up to 9 people. Place is as advertised and more. We were 3 couples and 3 babies and loved our stay. Owner was very helpful and accommodating. Highly recommended. Perfect Location in Haro and an Incredible Host! Heinz's apartment in Haro is the perfect location for a quiet getaway. Whether you want to go wine tasting or go for pintxos, the apartment is only a 5-8 min walk away through a historic and beautiful city. Heinz was an incredible host who helped us by meeting us at the train station and taking our luggage, all without asking! I could not recommend this property enough, it feels like home in a place you've never been.